Okay, we get it. It’s winter. Can we have the sun and warm weather back please? We’ve just had the coldest December day in thirty years. A perfect day to go out and take pictures of Christmas cakes. As snarky as I may get about some of the cakes, I admire the creativity and artistry that goes into these cakes. Remember that these are mass produced for sale at chain bakeries, ice cream parlors and doughnut shops. And they each come out pretty sharp. We saw a few cakes from last year and some repeated themes, but it’s still been a cool year for the phenomenon known as the Korean Christmas cake. We start out with DD, which is sort of the B-team of Christmas cake makers. But they’ve improved a good deal this year. It’s better than some of the big chain bakeries a few years ago. And actually, this would be up my alley. Coffee cake coffee! I don’t think those berries are edible. I think this is some reindeer-bear crossbreed. I think I saw it on an episode of Avatar: The Last Airbender (the good anime one, not the movie). Oh, I get it. I thought it was our only bundt cake entry this year. It’s a cake shaped like a doughnut! BR came out with some new character ice cream molds. Remember that the ice cream cakes in Korea have no actual cake. They’re all ice cream. Check out Ssing Ssing Ski Bear up there. Quite the star. BR still has restricted itself to one holiday, so we have the singular wish for one single Happy Holiday–all supplemented by an angel with a keytar. Santa is king of the hill and has won his present fair and square. I see we’re going for more cookies this year, something that was started last year. Ya know, it’s only a few more easy steps to put actual cake in those ice cream cakes. It was so cold on Christmas Eve that they didn’t have to worry about any of these melting. Santa is king of the tree stump! Good for you, Santa. This character is quite satisfied with a job well done. No idea what that job was. Ooh, a ski snowman–very appropriate for an ice cream cake. Chocolate decadence with an angel and a keytar. Isn’t that one of the twelve days of Christmas? This snowman is building a fort of delicious. The undisputed king of Christmas cakes, Paris Baguette’s theme this year was “You are not alone.” I don’t know if they were quoting a Michael Jackson song, if it was a reference to Christmas being a couples holiday in Korea, or a positive message for people who get depressed this time of year. 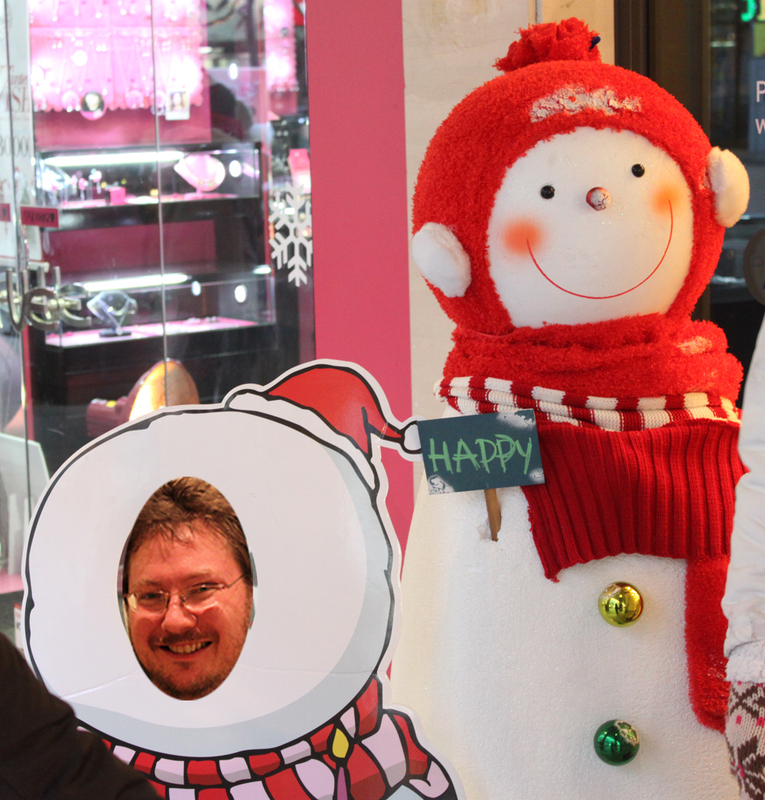 Most all the PB outlets had this child-sized cardboard snowman cut-out for picture taking. No one would take my picture for me. Gingerbread men are always fun. How many bodies do you see here? Determined polar bear catches a chocolate wave. I think this was our angel from last year. No wings, but she has a star. And I dig those snowflakes. A documentary into the secret life of the cake penguin, who lives in an igloo and hangs his laundry on a line. Drying out laundry? On a cake? Do kids fight over who gets to eat the hat? Speaking of which, it looks like Santa lost his hat in that volcano. Hoop skirt Santa is doing his laundry too. Well, he is not alone. And neither are you. That’s a lot of foliage. I think Queens looked like this when that tornado struck. Santa has killed the elusive winged snowman and poses with his prize. Yea! Big cookies are still here! Santa is trying to sneak into that gnome’s house. I guess that gnome has a trick up his sleeve. Another Santa doing his laundry. Think about it. That’s a pretty elaborate cake for a bakery chain. I wonder what lucky kid got this one? The danger with this is that there’d better be a Thomas train set under the tree to accompany that. Santa pushes his sleigh in the desert. Ya know, it’s really hard to do Christmas themes on a sweet potato cake. Another tornado struck Strawberry Shortcake’s trailer park. Choux cream snow folks. Cool! This shouts PRINCESS! The shape disturbs me. Ah, the offset layer cake that we first saw last year. This was the only example I found of it this time. That actually looks good. Classy. I think this is a tiramisu with macarons. Pororo makes an appearance. I wonder if this place had the rights. Not quite the fruitcake I had in mind. Well, okay. I’ll just go back to Paris Baguette. I didn’t notice many K-pop groups. I want to eat them all……..